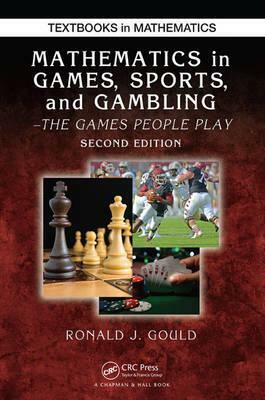 Mathematics in Games, Sports, and Gambling: The Games People Play, Second Edition demonstrates how discrete probability, statistics, and elementary discrete mathematics are used in games, sports, and gambling situations. With emphasis on mathematical thinking and problem solving, the text draws on numerous examples, questions, and problems to explain the application of mathematical theory to various real-life games. This updated edition of a widely adopted textbook considers a number of popular games and diversions that are mathematically based or can be studied from a mathematical perspective. Requiring only high school algebra, the book is suitable for use as a textbook in seminars, general education courses, or as a supplement in introductory probability courses. Exercises are included in each section to help students understand the various concepts. The text covers permutations in the two-deck matching game so derangements can be counted. It introduces graphs to find matches when looking at extensions of the five-card trick and studies lexicographic orderings and ideas of encoding for card tricks. The text also explores linear and weighted equations in the section on the NFL passer rating formula and presents graphing to show how data can be compared or displayed. For each topic, the author includes exercises based on real games and actual sports data. Are the Old Adages True? How Good Are Certain Measurements? Ronald J. Gould received a B.S. in Mathematics from the State University of New York at Fredonia in 1972, an M.S. in Computer Science in 1978 from Western Michigan University, and Ph.D. in Mathematics in 1979 from Western Michigan University. He joined the faculty of Emory University in 1979. Professor Gould specializes in Graph Theory with general interests in discrete mathematics and algorithms. He has written over 170 research papers and one book in this area. Professor Gould serves on the Editorial Boards of several journals in the area of discrete mathematics. Over the years he has directed over 25 master's theses and more than 25 Ph.D. dissertations. Professor Gould has received a number of honors including teaching awards from Western Michigan University (1976) and Emory University (1999), as well as the Mathematical Association of America's Southeastern Section Distinguished Teaching Award in 2008. He has also received alumni awards from both SUNY Fredonia and Western Michigan University. He was awarded the Goodrich C. White Chair from Emory University in 2001.